I lived in Germany after graduating university and one thing among many for which I developed an affinity is white asparagus. It is eaten far more widely in Germany and daresay, much of the world, than the green variety and has such a delicate and soft flavor that it really makes the green variety seem astringent. When I lived there, the predominant preparation was with a heavy cheese sauce, however. Which is good at times but not particularly appealing on a hot summer day in New York. It turns out that Mr. Scrumptious loves it too, so I've been thinking of a bright, fresh summer preparation to please us both. With a little thought and memory of a spectacular soup I once had, I came up with a beautiful and tasty side dish that will work well with almost any protein you serve on the lighter side. This is my "White Asparagus with Orange-Herb Sauce." My idea for this recipe sprung up when I remembered the most incredible white asparagus soup I had at Jean Georges, a spectacular New York restaurant, a couple of years ago. I have never forgotten that amazing concoction and the stunning surprise that made it so memorable was the citrus flavors used in the soup. While I haven't attempted to re-create that dish yet, this idea was indeed a play on what I learned about the combination of white asparagus and citrus and the way in which a soft and delicate flavor can be further drawn out by a slightly tart yet still sweet acid. By the way, white asparagus has a reputation for being bitter, but it's not true if you heed a couple of important rules. Buy it fresh and young, make sure to always snap off the bottom where it's thick and woody and you MUST peel it well. The outer skin is definitely more bitter than green, so just whisk it away. I also use the jarred white asparagus in certain recipes, but not this one. You must go with fresh here, to get the fantastic fresh tastes! 1. Cover the bottom of a large, wide skillet with 1/2" water and bring to a boil. Add three pinches of kosher salt and the asparagus. Cover, reduce heat to medium and let steam for 8-10 minutes, until stalks are fork-tender. Remove the asparagus from the water with tongs and set aside. Dump the water out of the skillet and return to heat on the stove. 2. Adjust the heat to medium-high and add the extra virgin olive oil. When shimmering, add the shallot and saute until translucent, about 3-4 minutes. Squeeze in the orange juice from each half of the orange, add the sweetened lime juice and stir. Turn heat to low. 3. Let the juices reduce by about half and then add the fresh herbs and cold butter, and stir with a wooden spoon until incorporated and melted. Season to taste with kosher salt and ground white pepper. 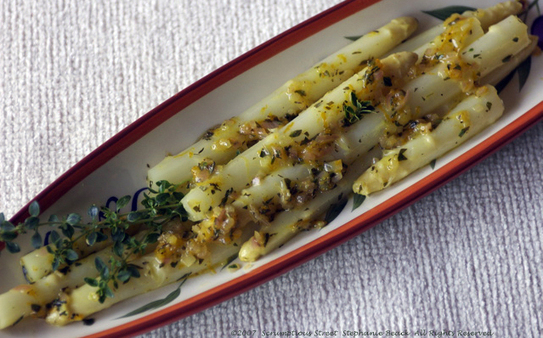 Gently place the asparagus back into the skillet and reheat and toss with the orange-herb sauce. Serve the asparagus and spoon extra sauce over the top. Serve immediately. SallyBR completely cleaned up in this game!! She guessed the number of tomatoes exactly right at 18! And, she was also the closest on growth with her guess of 14 inches. It actually was 26" at the time (!!!Yes!!!) so no one was really very close. But, she wins both parts of the game. 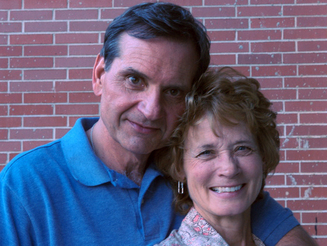 Congratulations, Sally!!! See, it pays to come out and make yourself known. I'll email you regarding details of your prize, etc. 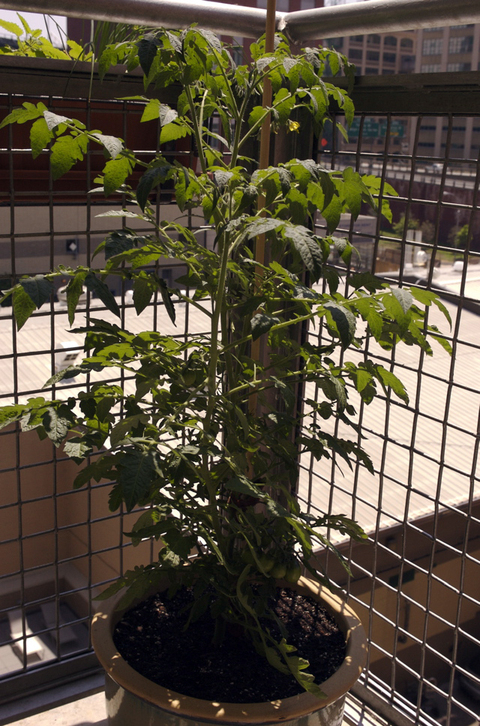 By the way, this tomato plant is really thriving, since I posted the game 5 days ago, it's added another two inches in height and another 5 tomatoes. Really, wonderful! Tonight I checked it and noticed one of the tomatoes is starting to turn yellowish -- an exciting sign that ripening is on the way. It's going to be a good summer, I hope! Let's Play a Game! A Tomato Game! I am so absolutely, wonderfully thrilled with the progress of my herb garden, but especially my Black Plum Heirloom Tomato plant. I come home every night, giddy with excitement at seeing its progress. Maybe I do have a little bit of a green thumb after all. 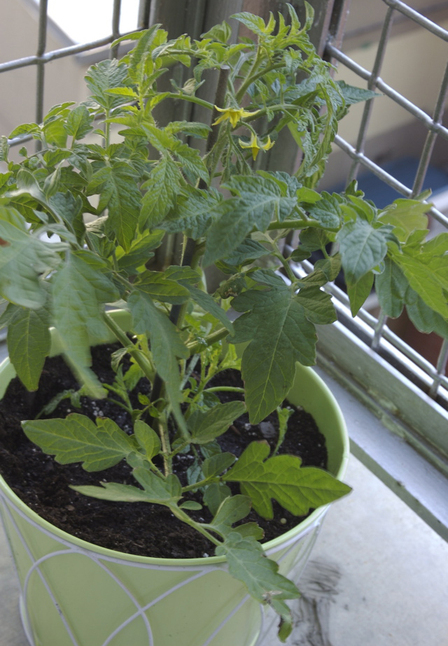 So, let's play a game: I will send a prize to the person who guesses the number of tomatoes that are now on my plant (without going over) and a prize to the person who guesses how much taller it has grown (without going over) since I bought it on May 5. Picture below is from the day I bought and planted it. 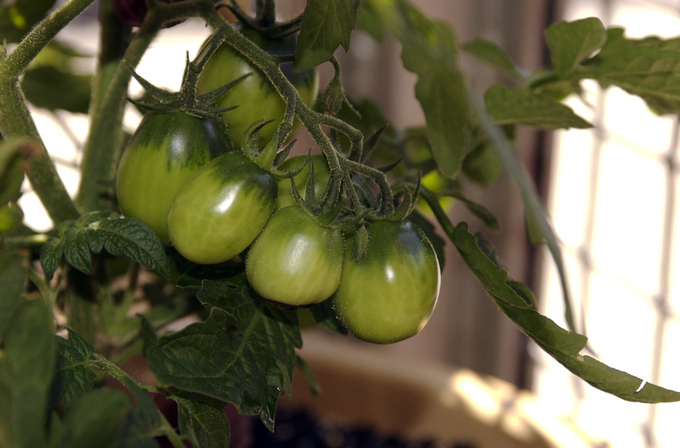 Guess the growth in inches and number of tomatoes as of June 14. Put your guesses in the comments section, I'll post an updated photo and the answers and winners sometime next week. Here's another really spectacular but simple salad that was a spontaneous creation from the gorgeousness at the Farmer's Market. Whenever I see something I've never cooked or used before at the market, I always snap it up and begin thinking of ways to use it. This was such a delightful and easy salad to make, but wow, the results were incredible. The key, really, is the sunflower shoots. I hadn't tasted them before and they are stunning and really have a rich and nutty sunflower seed flavor with a delicate texture of bean bean sprouts and fresh light crunch. They are extraordinary. I paired them with the slightly sour purslane microgreens and a few slivers of radishes and small grape tomatoes. Wow. Whatever greens you can find, this is proof that it's wonderful to taste anything that's new-- you'll never know what you may find. And, the purslane is a wonderful source of omega-3 so heart healthy too. 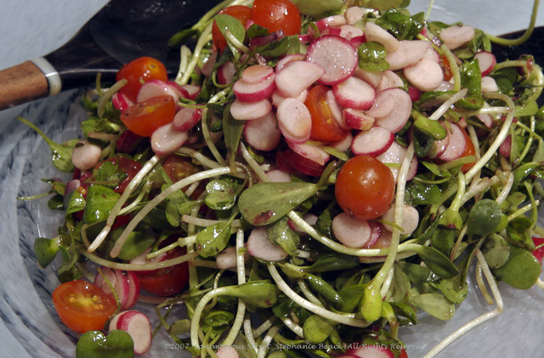 Here's my "Salad of Sunflower Shoots, Baby Purslane, Radishes and Tomatoes in a Blood Orange Vinaigrette." I chose to use hazelnut oil in this vinaigrette to play out a different kind of nutty flavor and also because I think the flavor goes extremely well with oranges. Since I had a couple of terrific blood oranges on hand, that's what I used. The dressing was so simple but just a luscious and light combination. 1. Wash and dry all vegetables. Spread the greens in a medium bowl. Finely slice the radishes, cut the tomatoes in half and sprinkle over the greens. 2. In a small bowl or measuring cup, mix the hazelnut oil, blood orange, salt and pepper and whisk together into a smooth and emulsified dressing. Drizzle over the salad, toss very gently and serve immediately. Mom and Dad Scrumptious came to visit over the recent long weekend here in the States and some of the best parts of their visit was tending my new herb garden -- it's growing so well especially with Mom's help -- replanting my spectacular tomato plant that already has doubled in size and has 7 gorgeous tomatoes already and doing homey chores and things around our apartment. But, of course I love cooking and we all love eating so lots of food and delicious meals were happening at Scrumptious Street. I would ask Dad to name an item he was craving or wanting and I'd cook a meal around it. We had so much fun with this kind of secret ingredient meets mystery menu dinner. Mom and Dad Scrumptious don't have access to spectacular seafood like we do in NYC so one night scallops were his ingredient of choice. With that, I created a wonderful light and summery pasta with the freshest scallops and clams I could find. And yes, I also used my own fresh herbs! I am LOVING the herb garden. I walk out while taking a pause in cooking and snip, snip, I bring back the lovely goodness I need and never have to worry about using it all before it goes bad or loses its flavor. What a terrific addition to my kitchen! In this recipe I used white pepper instead of black pepper. 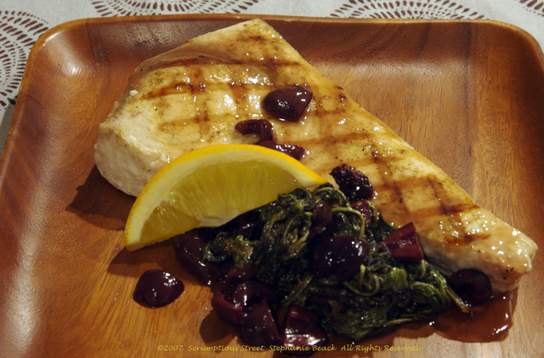 It has a gentler and subtler flavor which I really love with seafood in particular. If you're in the habit of only using black pepper, give the white a try. Also, the sauce is really very light and much more a condiment for the seafood and the pasta so make sure you use really good, fresh pasta, clams and scallops here. The quality is very crucial to the taste of the dish. As well, both of these seafood are extremely easy to overcook and as soon as they do, they are ruined and rubbery. If you spend the money for fresh scallops and clams, make sure not to multi-task too much and really get them off the heat as soon as they are done -- which is under 5 minutes in both cases. 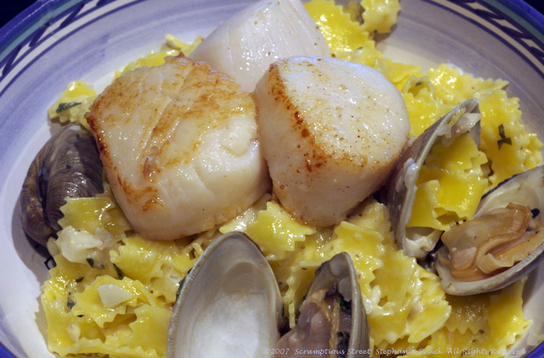 Here is my "Dad Scrumptious Sea Scallop and Clam Tagliatelle". 1. Bring a large pot of water to rolling boil and place a second large skillet on pan on stovetop and heat to medium high flame. 2. Add the olive oil to the skillet and saute the onion and garlic until translucent, stirring frequently. At this point, the water should be boiling so add 2 tsp. of kosher salt to the water and the fresh tagliatelli. Swirl the paste to cover evenly with water. If you're using dried pasta instead of fresh, put the pasta in the water before you start the sauce. Dried tagliatelli will take about 8-10 minutes, whereas fresh pasta will take 3-5 minutes. 3. Squeeze the lemon juice into the skillet and add the white wine. Add the clams and cover the pan. 4. Bring another skillet to high heat, add the butter and melt. Pat the scallops dry with a paper towel, season with kosher salt and white ground pepper and place in the skillet. Sear 2 minutes on the first side and flip. Sear another 2 minutes on the second side and immediately remove the scallops from the heat. 5. At this point the pasta should be done and the clams should be done as well. They are done when their shells are fully open and this should not be more than about 4-5 minutes. 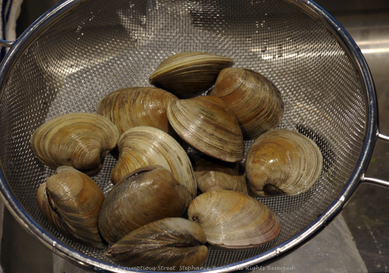 Drain the pasta and add it to the skillet with the clams. 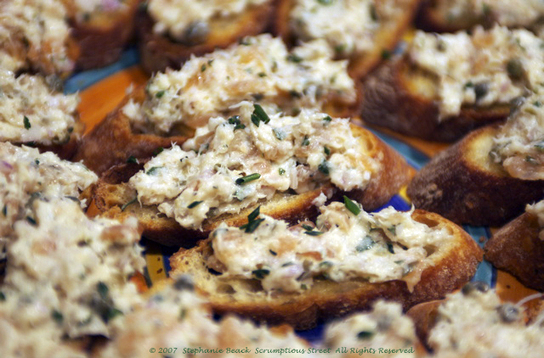 Toss gently with tongs and add the herbs and cream. Toss again gently and remove from heat. Discard any clams that didn't fully open. Serve immediately and place the seared scallops on top of the pasta and clams.